Every year a girl and her family visit the same beachside motel on their summer vacation, and follow the same routine, but things change slightly this year when the girl makes a new friend. The illustrations are the real selling point of this attractive picture book. Each page features pen-and-ink outlines painted and colored in with different textures which suggest features of the beach: grass, shadows, sky, water, sand, and fog. People are depicted as simplified figures with few facial features, but their body language tells their stories as they swim, play catch, play music, and roast marshmallows over the fire. Among many wonderful pictures, an especially amazing campfire stands out as exceptional. 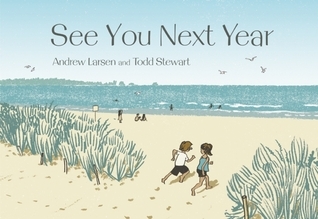 The lovely poetic text works well with the illustrations to evoke the bittersweet emotions associated with the end of one season and the beginning of the next. This book is a lot like Cynthia Rylant's The Relatives Came. Both books have the same rise and fall of anticipating an important visit, having the experience, and then winding down from it, and they evoke a deep sense of nostalgia in the reader. Both stories are also told in beautiful declarative sentences that perfectly distill each important moment. Another possible read-alike, because of its focus on a summertime friendship is A Couple of Boys Have the Best Week Ever by Marla Frazee.